There are approximately 25,000 people in the US who get ankle sprains per day. Ankle sprains are the most common type of sports injury accounting for approximately 50% of all athletic injuries. Of these, approximately 80% of them are lateral ankle sprains (on the outside of the ankle). A sprain is when a ligament gets damaged (as opposed to a strain where tendons or muscles are the primary tissue damaged). A ligament is a band of connective tissue that connects one bone to another bone. Sprains are broken into 3 different categories. Category 3 – A severe sprain with complete rupture of the ligament. Why do most of the ankle sprains happen on the lateral side? A little background first. Joints can broadly be categorized as being held together in one of 3 major ways. Primarily by: 1) bones; 2) muscles or 3) ligaments. The ankle is held together primarily by ligaments. There is a major difference in the strength of the ligaments on the medial (middle) side of the ankle compared to the lateral side. The medial ligament is a broad solid triangle of connective tissue called the deltoid ligament. The lateral side of the ankle has primarily 3 relatively small strands of ligaments. 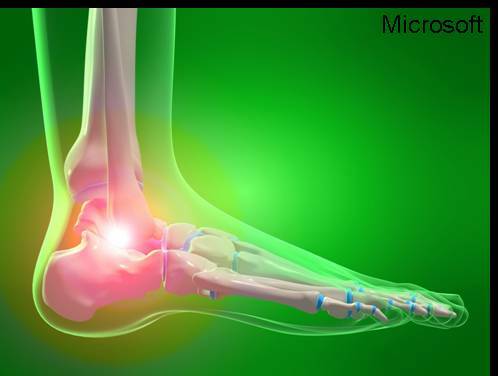 The relatively poor ligament strength on the lateral side of the ankle is responsible for the much higher percentage of sprains taking place on the that side. Which of these 3 lateral ankle ligaments is most commonly sprained? This is determined by an additional factor that has to do with the shape of the bones. The ankle joint is formed by the distal ends of the tibia and fibula (the lower leg bones) together making a ‘U’ shaped notch where the talus (upper foot bone) fits into. The talus surface that fits into the notched tibia/fibula is not the same width throughout the foot’s range of motion. It is widest and fits most snugly when the foot is in the standing position. When the foot is pointed down, the articular surface of the talus that fits into the notch is more narrow and fits loosely. This result in the ankle joint being relatively wobbly when the foot is pointed. Common activities that result in this more unstable position happen when the foot is in front of the body and just making contact with the ground during the gait cycle. This gives rise to the very common scenario of someone twisting and spraining their lateral ankle when they are running and their foot lands on an uneven surface or rock and twists to the outside. The ligament that takes the brunt of this damaging twist is the anterior (towards the toes) of the 3 lateral ankle ligaments.